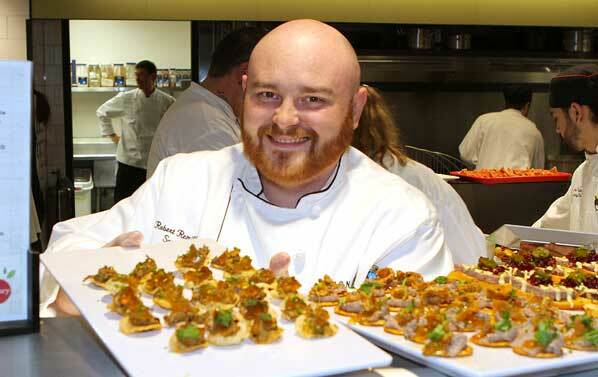 Bon Appétit souse chef Robert Remillard serves up enticing appetizers. 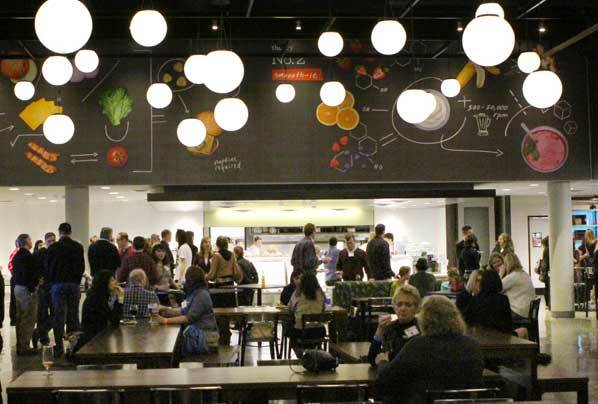 The days of serving “ho hum” food at the Oregon Museum of Science and Industry (OMSI) in their café are over – and the transformation of its café goes way beyond a redecorating job. Its new name – “THEORY” – reflects the food service’s new approach to dining, OMSI President Nancy Stueber told East Portland News at its grand opening earlier this year. 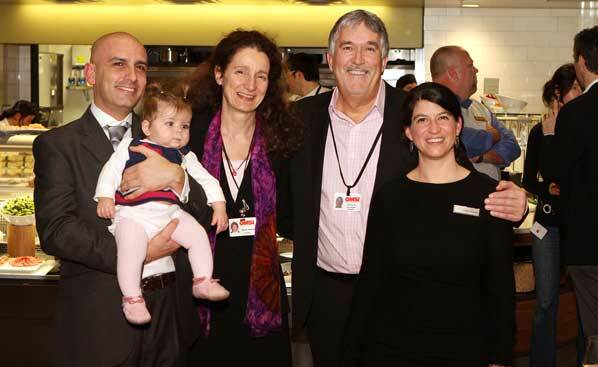 At the grand opening of THEORY, OMSI Development Director Mark Patel (holding baby Eva), OMSI President Nancy Stueber, Bon Appétit’s Sam Currie, and Chef Sydney DeLuna, all agreed that they’re thrilled with their new “science café”. In addition to good food, Stueber pointed out, the café also offers exhibits, displays, science demonstrations and events. “We’re proud to say that this is unique; a place where you can have a great meal – and also learn about the science of food,” Stueber said. 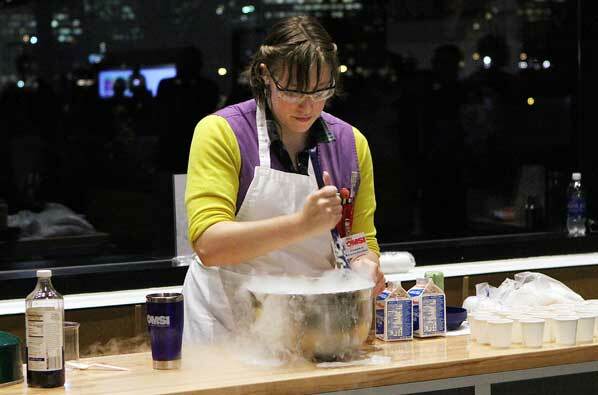 OMSI Sr. Science Chemistry Demonstrator Elizabeth Dannen demonstrates how to make fresh ice cream – using liquid nitrogen. 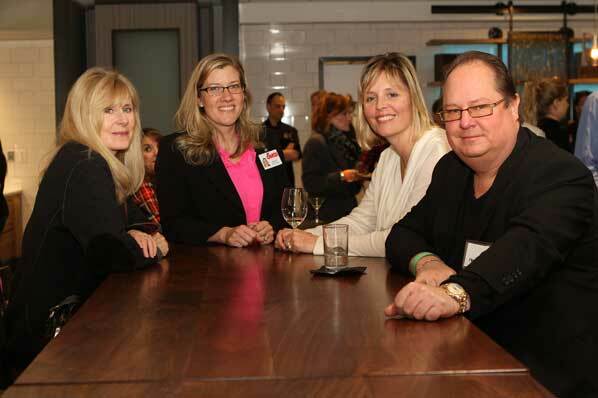 Guests Arlene Heitzler, Megan Strong, Sharr Stark, and Peter Stark enjoy the ambiance of THEORY. Currie said that Bon Appétit has been the caterer for OMSI for about six years. “We’re really excited about taking this partnership to the next level – exploring science and food. When people get together and break bread, and share food and conversation, it’s the cornerstone of ‘building community’,” Currie added. 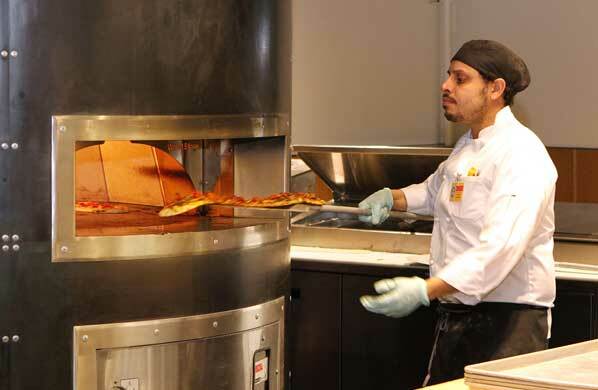 Chef Joaquin Fernandez takes a bubbling hot pizza out of the new brick oven. Stueber pointed out OMSI Development Director Mark Patel as being the person behind the creation of THEORY. “I’d call myself a co-conspirator,” Patel admitted with a smile. THEORY provides good food, in a fun learning atmosphere at OMSI. The 9,100 square-foot THEORY, which retains its stunning riverfront view, may become a destination in its own right. It’s open Sundays through Thursdays from 8:30 a.m. until 6:00 p.m., and open later, until 8:00 p.m., on the weekends. OMSI is located at 1945 SE Water Avenue. For more information, see their website: CLICK HERE.